When building your Dapp for Ethereum, you will commonly use testrpc for testing your app on a local blockchain. However, you will soon find you want to test the app on a live blockchain. Ethereum allows you to test on a network call Rinkeby before deploying your app live. In this guide, I’ll take your through a deployment on Rinkeby, including setting up your account, and testing your app. To start, you will need to sink the Rinkeby network locally and to have it running so we can send our app. 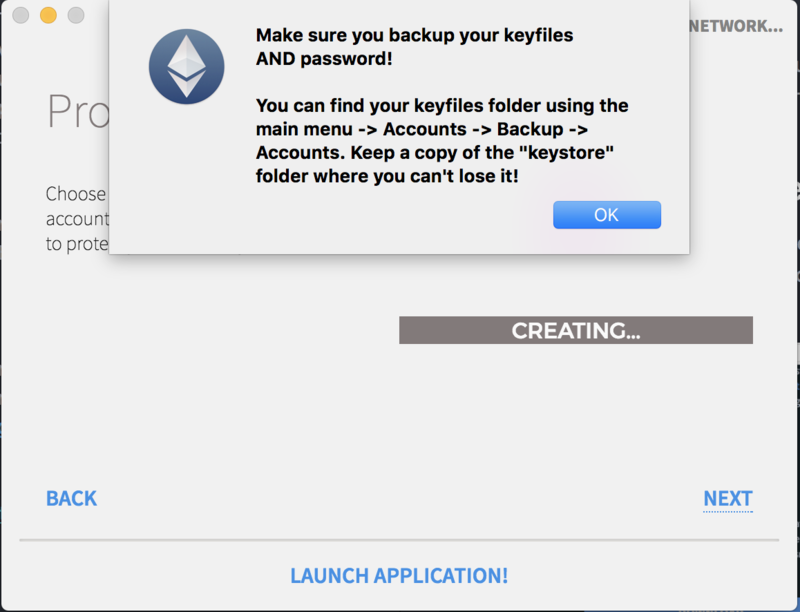 Start by downloading the official Ethereum wallet on this page https://www.ethereum.org/. Once downloaded and installed, open the app and click Use Rinkeby. 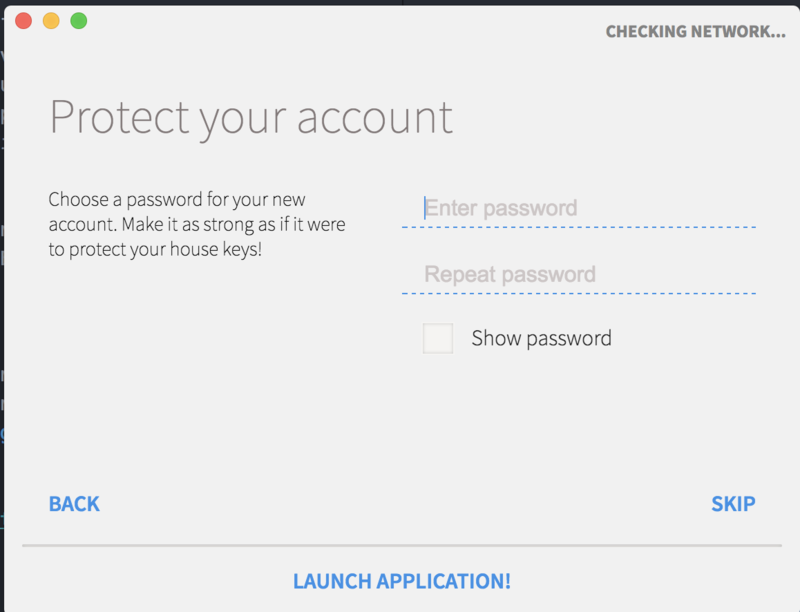 Enter a password for your Rinkeby account. Then take note of where your wallet info is stored. Wait for the network to sync (this could take a few hours). Then click “Launch Application”. 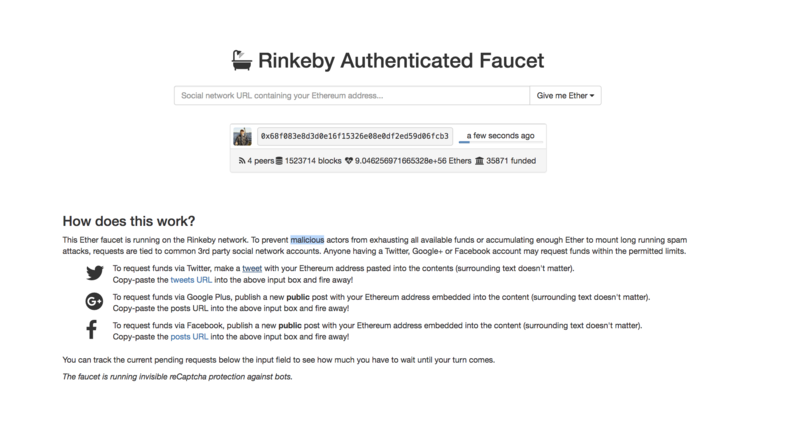 The next step is to request Ether from the Rinkeby Faucet. The faucet is setup to give users test out their applications on the network. 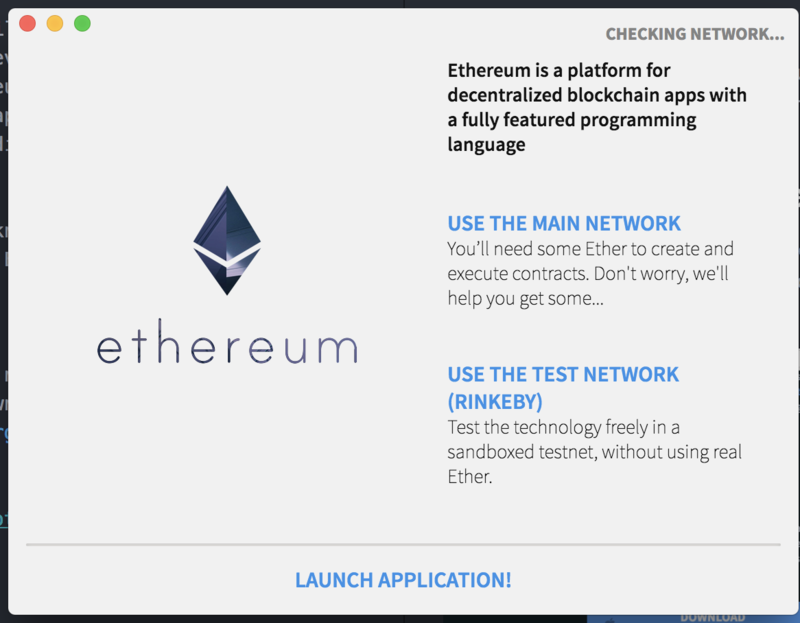 On the actual Ethereum network, you will need to mine or buy ether to use your app. To prevent malicious actors, Rinkeby asks users to use Social Media to request Ether. You can read more about there here: https://www.rinkeby.io/#faucet. For this tutorial, we will use Twitter to request ether. Note that it can take a few hours to a few days depending on how much ether you request. Select the wallets tab at the top and copy the address for one of your accounts. You should have one Main Account now if you have been following along. This will load a populated tweet where you can enter your test network address to request Eth. Go ahead and past your address in the place of the 0x0000000000000000000000000000000000000000 address. Go back to the faucet page. You will see a form at the top. Paste the link to your post there and click how much Ether you would like to request. You will then be presented with a loading screen to show when your Ether will be funded. Now that we have some Ether, let’s deploy an app to test. Feel free to use an app you have already built, for this tutorial, I will use an example app from Truffle. We will then deploy the the Dapp to the test network Rinkeby. Creating a Dapp is out of scope of this tutorial. We will be using the completed example from the Pet Shop tutorial: http://truffleframework.com/tutorials/pet-shop. Find that directory from your tutorial. Replace the address below with your test Ethereum address and the password with the one you used during Mist setup. geth --rinkeby --rpc --rpcapi db,eth,net,web3,personal --unlock="0x0000000000000000000000000000000000000000"
Be sure to add your test Ethereum address in place of the place holder. Okay, now we have successfully deployed our app on Rinkeby. The next thing to do is use it. We will simply run the app locally and switch Metamask to the Rinkeby test network. This will allow use to send transactions through Rinkeby rather than our local testrpc from before. We are running this locally, but you can deploy this Netlify, AWS, Azure, etc and Metamask will inject the web3 console to allow for use on the blockchain. Go to Mist and click File -> Backup -> Accounts. Click on rinkeby -> keystore. This is the file you will need. Go to Metamask in your browser, select Rinkeby, import account then select the file above. Enter your password. Now open up your app and you are running on the Rinkeby test net! There is a lot going on here, but most of it is one time set up with your Wallet. Once you have an account and Ether, it should be easy to test out future apps.